Today I am going to review the Red Bearberry & Passion Fruit All Purpose Moisturizing Cream by VLCC(Natural Sciences)-Suitable for all skin types. VLCC is a well-known skin-care brand(Indian). A light,quick absorbing, non-greasy cream that keeps your skin nourished and supple. Passion Fruit,rich in vitamin A and anit-oxidants, removes skin damaging free radicals and stimulates cell renewal while Red Bearberry lightens skin texture by reducing pigmentation and blemishes to leave your skin well nourished,smooth and healthy. *The product comes in tub.There are different sizes available like 75ml,150ml etc. *I like the orange-coloured border of the lid and entire tub-body is of white colour.Like the combination. 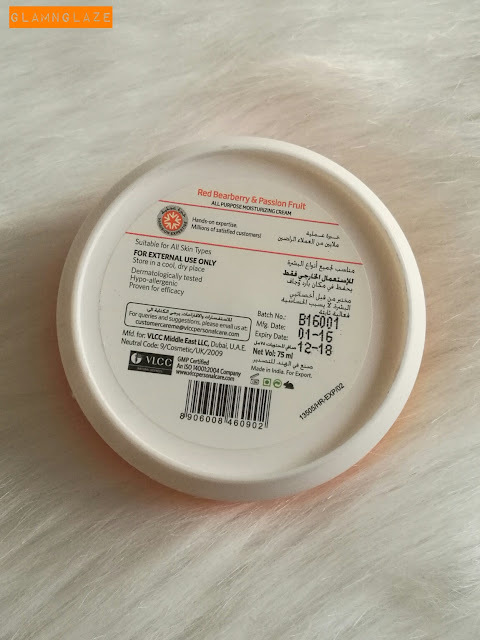 *All the information related to the product is mentioned on the back(bottom) of the tub itself.Info like manufacturing date,Expiry date,shelf-life etc. 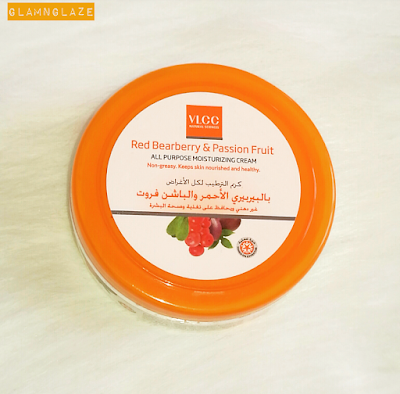 *The cream consists of extracts of red bearberry and passion fruit.Also,olive oil,vitamin E etc. *These ingredients are really helpful in keeping the skin healthy and moisturized. *Also,the cream has little thick consistency,but,still it gets absorbed into the skin quickly. *The product has a very different fragrance.I had never smelled anything of that sort ever. *Once applied on body,the fragrance of the product lingers thoughout the day.In love with the fragrance. Apply the product on moist skin.As the name of the product suggests,it's a massage cream,it should ideally be applied on body right after bath for best results. *Yes,very effective.The cream is non-greasy/sticky and light-weight indeed . *It really keeps the skin hydrated. *Apply it twice daily and you will certainly feel the change.The skin feels soft and supple. *Since,the product comes in a Tub,it might get contaminated easily (if applied using (unwashed/improperly washed) hands. 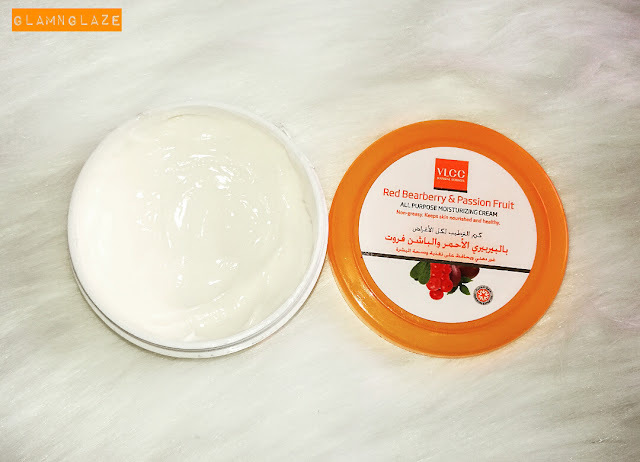 *The best body massage cream that prevents skin-dryness.Highly recommend! Use small-spoon,spatula to scoop-out the product from the tub.This will help in preventing product-contamination. Bearberries are Found in North and consist of essential oils etc. that are used in liquid extracts and medicines. Passiflora edulis is a vine species of passion flower that is native to southern Brazil through Paraguay to northern Argentina.It's common name is passion fruit or passionfruit (English). Passion Fruit is cultivated commercially in tropical and subtropical areas for its sweet, seedy fruit. The passion fruit is a pepo, a type of berry, round to oval, either yellow or dark purple at maturity, with a soft to firm, juicy interior filled with numerous seeds.The fruit is both eaten and juiced; passion fruit juice is often added to other fruit juices to enhance aroma. Thank for the review, use Skinatura Charcoal Massage Cream It would give you smooth and elastic skin.